An aerial view of the Tuna Canyon Detention Station was displayed at the June 11 meeting of the Planning and Land Use Management Committee. The Planning and Land Use Management (PLUM) Committee of the Los Angeles City Council held a public meeting June 11 on whether to designate the Tuna Canyon Detention Station site in San Fernando Valley as a historical/cultural monument, as proposed by Councilmember Richard Alarcon. Following are letters that have been sent to the committee, which is composed of Councilmembers Ed Reyes (chair), Mitchell Englander and Jose Huizar. “Waroku Yokota came to the U.S. in 1899 at the age of 17 to work on the railroads in Cheyenne, Wyoming. He would eventually move to California, working as an agricultural laborer before setting up a chicken farm and hog ranch, and later worked in the transportation of agricultural goods. Settling in Los Angeles, he would eventually start up a number of sewing schools and later operate hotels in downtown Los Angeles. “Through this time, he married, had children, and continued to contribute to the social fabric and community institutions of Los Angeles. He worked hard in the U.S. for 42 years before the start of World War II, at a time when he was ineligible for citizenship due to racially exclusionary laws that prevented his naturalization. “Following the bombing of Pearl Harbor … the course of the Japanese American community would change forever. In the dark days following these events, he would eventually be arrested on false suspicions, sent to the Los Angeles City Jail, and would eventually be transferred to the Tuna Canyon Detention Station. From there he was sent to the Department of Justice internment camp in Fort Missoula, Montana. 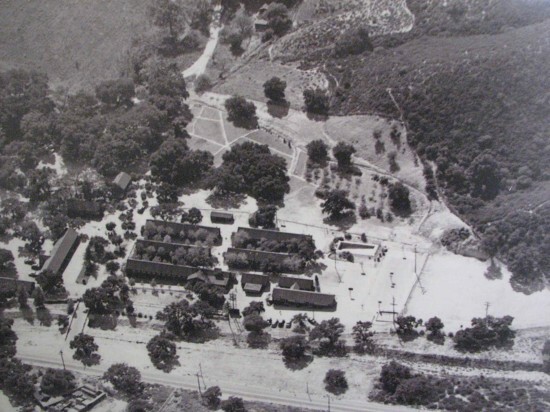 Upon his release from that camp, he would be held at the Santa Anita Assembly Center, before being sent to a Japanese American concentration camp in Rohwer, Arkansas, where he would remain for the duration of the war. “He was never found guilty of any crime or act of treason. He had been incarcerated for four years solely on the basis of his national origin and race. “At the time my great-grandfather passed away in 1962, there had been no Japanese American redress, and no apology or compensation for the incarceration experience that he and many other Japanese Americans suffered through. This experience was simply a hushed secret not to be discussed. The loss of time, livelihood, and property was something that was borne in silence. “It has only been through the conscientious effort of many members of the Japanese American community that this shameful moment in our history has been exposed to the light of day. “I am grateful to live in a city that has an ordinance and administrative code that empowers citizens to preserve the memory of such events for future generations. “1. The commission believes that the Tuna Canyon Detention Station site has as a particular historic and cultural significance to the City of Los Angeles. “2. The commission believes that the site reflects and exemplifies the broad cultural, economic, and social history of the nation, state, and community. “In being so honest as to state that events related to the Japanese American internment ‘at this site’ are unquestionably significant and deserving of wider recognition and understanding, even the commission concedes, against its own recommendation, that the site has a powerful ability to convey the historical associations that made it significant. “I can see what is happening here. “No one is at fault for not being Japanese American. No one is at fault for not having a family member interned at this or another United States government detention facility. No one is at fault for never having had their constitutional rights suspended by the government whose sacred obligation was to defend them. No one is at fault for never having had their personal property unconstitutionally seized and liquidated by their government. “I get that when the honorable commissioners of the Cultural Heritage Commission … see the Verdugo Hills Golf Course, they see only the Verdugo Hills Golf Course. When I look at the site of the Tuna Canyon Detention Station, I don’t see a detention station either. “The detention station and the look of the land as they used to exist are no longer there. “That is exactly why the community-based organizations, business leaders and citizens who have grown the Change.org petition for Councilmember Alacon’s proposal to 1,213 signatories want the city and the council to designate the Tuna Canyon Detention Station site a historic-cultural monument. “Governments love to talk about transparency and accountability but no government enjoys building a landmark that advertises to eternity its historical betrayal of its own people. That kind of healing can only be accomplished by truly great governments and elected officials. • Russell Endo: “I am a retired professor of sociology and ethnic studies (at University of Colorado) … My grandfather, Heigoro Endo, was imprisoned in this detention station. “Heigoro was 15 years old when he came to the U.S. from Japan in 1900. Over time he had a variety of jobs in the Pacific Northwest and Northern California. Later, he got married, became a fisherman working out of Terminal Island, and then ran a pioneering sports fishing business at White Point, San Pedro. Like many Japanese immigrants, or Issei, my grandfather was technically an ‘enemy alien’ at the outbreak of World War II because of racist policies that prevented him from becoming a naturalized U.S. citizen. “At the end of March 1942, my grandfather’s family received notice that they had to leave their San Pedro home within a week … However, on April 1, my grandfather was arrested on a warrantless emergency basis by the FBI, taken to a local jail, and then sent to the Tuna Canyon Detention Station. “He, like thousands of other innocent Issei, was on government lists of enemy aliens suspected of subversive activities. An FBI letter suggests that Heigoro’s primary ‘crime’ was that he was an officer of the Compton Gakuen, a prominent Japanese language school. “In Heigoro’s absence, my grandmother, Ume, and my father, Hideo, had to get the family ready for their forced removal to the horse stalls of a temporary incarceration center hastily set up at the Santa Anita racetrack. Disposing of or making other arrangements for the family’s fishing boats, house, car, and other possessions led to substantial financial losses. “My father was eventually able to locate Heigoro and saved enough gas ration coupons to go to the Tuna Canyon Detention Station. The officer-in-charge, Merrill Scott, was an old acquaintance of my grandfather and facilitated my father’s visit. My grandfather complained about his confinement but otherwise reported that he was being treated well. “Under provisions of the 1926 Geneva Convention, my grandfather and other detainees were given individual hearings conducted by panels of citizen volunteers. However, detainees were not allowed to have legal counsel. For the Issei, these hearings merely determined the next internment or incarceration camp to which they would be sent. “My father attended Heigoro’s hearing, and his recollections bring to mind the colloquial phrase ‘kangaroo court.’ The citizen panel made numerous attempts to prove their suspicions of my grandfather’s complicity with the Japanese enemy. He was asked details about his fishing business, leadership of a Terminal Island fishermen’s association, and role at the Compton Gakuen. “At one point, accusations were made about his having certain contraband items like a short-wave radio. My father was able to produce receipts showing that these items had in fact been turned in to the police department. “On July 4, Heigoro was paroled to be ‘interned-at-large,’ which meant he rejoined his family who were now behind barbed-wire fences at Santa Anita. He was fortunate; most Issei detainees would be sent to other Justice or War Department internment camps and face more months or years separated from their families. “In the fall, my grandfather’s family was sent to the permanent incarceration camp at Jerome, Arkansas. After the war, he filed a claim under a law that provided minimal compensation to Japanese Americans for their wartime property losses. Only two-thirds of the dollar amount was approved; an attorney’s letter reveals that one government concern was Heigoro’s detention at Tuna Canyon. “My father got married, resettled in Chicago, and then moved his family to Tujunga. I was born during the war, grew up in Tujunga, and had an opportunity to visit the former Tuna Canyon Detention Station before the buildings were demolished. “I have been teaching students about the World War II experience of Japanese Americans for over 40 years, and I always describe in detail what happened to my family and to others. I try to make the broader story of injustice and tragedy come alive and, more important, emphasize a basic lesson. “Constitutional rights are not automatically guaranteed. They exist only to the extent that they are recognized and enforced. The wartime Japanese American experience shows that such recognition and enforcement become more difficult under ‘extraordinary circumstances,’ as in times of national crisis. This is wrong. Constant vigilance is required to ensure that civil liberties are never denied. These are excellent testimonies that capture the importance and relevance of Tuna Canyon. Thank you, Rafu Shimpo, for your principled coverage of this important campaign.